Welcome to Long Beach Heating and Air Conditioning, dedicated to serving the heating and air conditioning needs of Long Beach, Los Alamitos, Seal Beach, Signal Hill, Huntington Beach, Palos Verdes, the South Bay and surrounding cities since 1957. We specialize in providing exceptional heating and air conditioning service, repair, maintenance, sales, installation, and replacement, as well as air duct cleaning, ductwork installation, and indoor air quality improvements for homes and light commercial properties. Over the last six decades, we've served well over 90,000 customers and built a reputation for superior customer service, quality workmanship, reliable results, fair prices, and high integrity. We have more experience than anyone serving the local area, and are committed to providing personalized, expert service to meet each individual client's needs and budget. As a testament to the quality of our service, we've won “The Best of Long Beach” award for Best Contractor-Heating & Air, been awarded Bryant's prestigious Circle of Champions award two years in a row, and earned high ratings among several review sites, including Yelp, Customer Lobby, and Angie's List. With 20 employees and a fleet of 14 service trucks, we're fully equipped to handle the large number of heating and air conditioning repair calls we get on a daily basis. Our service technicians are all EPA and NATE certified and have years of experience. They arrive in uniform within the promised appointment window with a clearly marked service vehicle that is well-stocked with the latest tools and a variety of the most commonly needed replacement parts, such as filters, motors, fuses, contactors, electrical breakers, and condensate pumps. We’re extremely knowledgeable in diagnosing and repairing issues for all major makes and models of heaters, air conditioners, heat pumps, mini-splits, and thermostats, and provide upfront, flat rate pricing on all HVAC repairs. The diagnostic fee is $89 and we can provide priority scheduling with those on a Residential or Commercial Service Agreement. Call today to schedule your heating or air conditioning service appointment. We also perform heater and air conditioner repairs under warranty, and we'll waive the diagnostic charge if you decide to have us replace your equipment instead of repair it. At Long Beach Heating and Air Conditioning, we're proud to be a Bryant Factory Authorized Dealer. Based upon our decades of experience, we believe that Bryant offers our customers the best value in air conditioners, furnaces, heat pumps, mini splits, and packaged systems. Bryant's diverse range of HVAC equipment is known for its superior performance, energy efficiency, and durability. When installed by our factory-trained and NATE-certified technicians, their residential heating and cooling systems are also backed by Bryant's 100% satisfaction guarantee. We have HVAC systems to meet nearly any budget and can offer 100% financing on approved credit through Synchrony or the HERO Program. We also offer a “rent-to-own” program for those who don't qualify for financing. Call today for a free estimate on our heating and air conditioner sales and installation services. We specialize in designing custom solutions to meet the heating and cooling needs of residential and light commercial clients. For residential and light commercial HVAC systems, our experienced technicians provide high-quality, affordable tune-ups and maintenance for all major makes and models of air conditioners, furnaces, packaged systems, mini-split systems, and heat pumps. By having tune-ups on a regular basis, you ensure that your HVAC system is always running at peak performance. Our techs perform a multi-point check of your unit, swap out or clean filters, and test the system to ensure that it is working properly. These tune-ups also help to improve safety, maintain your unit's energy efficiency, extend its lifespan, and catch issues before they turn into major ones. For the best value, we recommend signing up for a Residential or Commercial Service Agreement, which includes two tune-ups a year (a fall heater tune up and a spring air conditioner tune up), priority scheduling for service and repairs, and a discount on parts and new media filters. Whether you are looking to improve the performance of your existing HVAC system or need to replace your system with one that is more reliable and energy efficient, our experienced team will ensure you get the best solution for your needs. We work hard to provide every client with personalized service and only make recommendations when we know that we can give our clients real value. In addition to providing comprehensive heater and air conditioner sales, installation, service, repair, and maintenance services, we also provide ductwork installation and cleaning, air purifying solutions, thermostat sales and installation, and more. We aim to be the ultimate source for all of your HVAC needs. Award-Winning HVAC Service Since 1957. Licensed & Insured. NATE Certified Technicians. Long Beach Heating and Air Conditioning is fully licensed and insured. Our contractor's license number is 168999, which is one of the lowest license numbers you'll find among any local Long Beach HVAC contractor. We carry a $2 million umbrella policy with workers comp to meet most HOA and property management company requirements. We belong to the Institute of Heating and Air Conditioning Industries (IHACI) and the Executive Association of Long Beach. Through ongoing training from NATE and our preferred manufacturers, we stay up to date on the HVAC industry's best service and installation techniques, developing technology and products, and local and state building codes, including OSHA safety requirements and environmental protection regulations. Long Beach Heating and Air Conditioning installed this new furnace in Huntington Beach, CA. 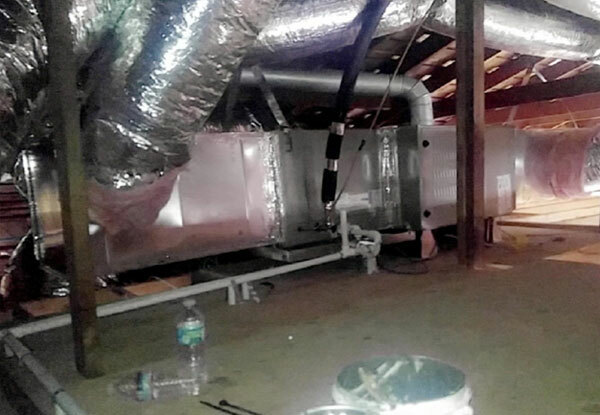 This residential furnace installation included all new ductwork and an evaporator coil for improved energy efficiency. . .